DFX Pro Staffer Chris Mazdzer is an American luger who has competed internationally since 2001. He competed at the 2010 Winter Olympics in Vancouver, finishing 13th. Mazdzer’s best finish at the FIL World Luge Championships was 6th in the men’s singles at Whistler, British Columbia in 2013. His best World Cup season finish was 13th in 2012-13. Chris utilizes the Dynaflex line of products to increase his grip strength as well as his overall arm conditioning. Chris Mazdzer was named to his first Olympics team on December 13th, 2010. In a two-run race-off with roommate Jonathan Myles, Mazdzer was edged out by 0.161 seconds for the team’s final singles spot for the 2006 Games. 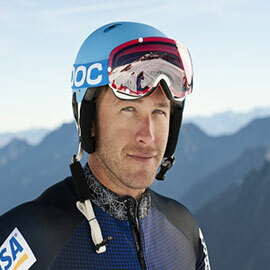 Competing in his second world championships in 2009, he finished 14th in Lake Placid. Mazdzer is one of the most-decorated junior competitors in USA Luge history. He is a three-time junior national champion (2006-08) and won numerous junior World Cup gold medals. He was also the 2005 Youth A men’s singles World Cup champ, the overall silver medalist in 2004 and the 2003 overall Youth A men’s singles World Cup silver medalist. He’s a native of Saranac Lake, N.Y., just 8 miles down the road from Lake Placid.